Mercator Advisory Group releases new research profiling South Africa’s prospects as an emerging payments market. Though considerably smaller in population (53.6 million in 2015) than other emerging economies in either the top tier markets (Brazil, Russia, India, and China, or BRIC) or second tier markets (Mexico, Indonesia, Nigeria, and Turkey, or MINT) with which it is often grouped, South Africa has arguably the strongest foundation for electronic payments of all these countries. In part this is because of its mature and stable banking ecosystem resulting from the country’s legacy with the United Kingdom. 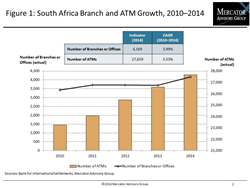 According to Mercator Advisory Group’s latest research note, Country Payments Market Profile: South Africa, the foundation is in place for a larger electronic payments market in South Africa, thanks to the relatively mature and stable retail banking landscape, and there is room for growth. This research note provides a high-level examination of key banking and payment indicators such as the number of bank branches and ATMs and the number and value of payment card transactions. Data is presented for 2014 and growth in the preceding five-year period and a SWOT analysis is provided of the market’s strengths, weaknesses, opportunities, and threats to evaluate its attractiveness from the perspective of the payments industry. This report contains 11 pages and 5 exhibits. Companies mentioned in this report include: Absa, First National Bank, Capitec, MasterCard, Nedbank, Standard Bank, Tencent, and Visa. Members of Mercator Advisory Group’s Global Payments Advisory Service have access to these reports as well as the upcoming research for the year ahead, presentations, analyst access, and other membership benefits. For more information and media inquiries, please call Mercator Advisory Group's main line: (781) 419-1700, send email to media@mercatoradvisorygroup.com.